You're not alone. Also, try to stay warm. A standout indie platformer with strong cooperative gameplay elements is hitting the Wii U eShop later this year, Nintendo announced today. Upper One Games' Never Alone is among the latest batch of indies coming to the Wii U, announced today alongside other up-and-coming releases like Don't Starve and Boxboy. 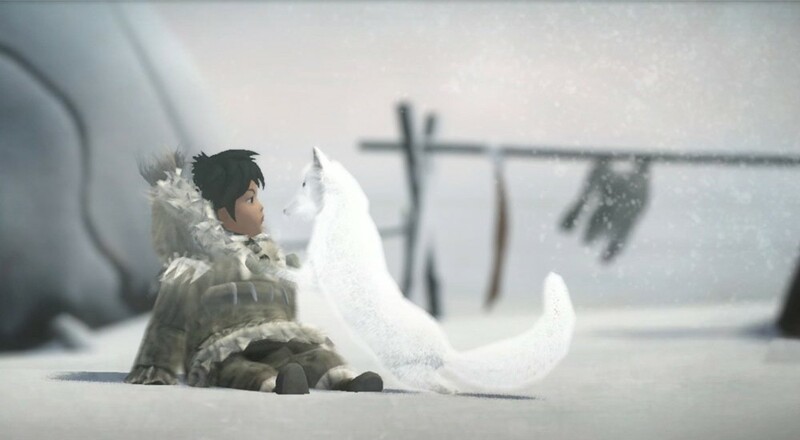 Never Alone puts players in control of a young Iñupiaq girl and her arctic fox companion as they seek the source of a devastating blizzard. Think of it as Limbo meets Brothers: A Tale of Two Sons - you'll need to cooperate with your partner if you're to survive the game's harsh wintry landscape. Developed in collaboration with the Alaska Native community, Never Alone incorporates aspects of Iñupiaq culture throughout. As players encounter in-game cultural elements, the game prompts them to view optional videos explaining their history and context. The Wii U version of Never Alone uses the GamePad's screen to provide contextual insights during gameplay without interruption, and also enables off-TV gameplay. Though the game features a single-player component, the quest really shines in co-op mode, where a local team of players control the girl and her fox simultaneously and solve environmental puzzles together. It's a unique experience, and the game's seamless integration of real-world cultural elements make it all the more memorable and worthwhile. The Wii U version of Never Alone is set to premiere in June. Page created in 1.3346 seconds.